Surfing the Internet seems easy by first connecting to the Internet through your ISP, running your favorite web browser software, typing in the URL to the address bar and hitting the Enter key to start loading the website. It is very straight forward and user friendly if everything goes well but could be frustrating if one of your favorite websites that you visit a few times a day suddenly does not load while other sites are working fine. Other than instantly ruling out that the website is temporarily inaccessible, there are many other reasons that can be causing this which is your Internet Service Provider is blocking the website, your DNS server is not resolving to the updated IP address, or even your computer is quietly blocking it through HOSTS file. The first step is to make sure that the website is completely inaccessible by everyone and not you alone. A logical way to confirm it is by asking your friends or relatives if they are experiencing the same problem but that wouldn’t be appropriate if it’s in the middle of the night and can get annoying if you’re doing that too often. Here are 5 online services that you can use to check and confirm if the website is down for everyone or just you alone without bothering other people. PageSpeed Insights is actually a free online service provided by Google to analyze websites, offering suggestions to speed up the website and not a service to check if a website is up or down. However in order for PageSpeed service to analyze the website, logically it will have to first load the website or else it won’t be able to calculate the score. We found that Google PageSpeed is very reliable because Google’s service will never fail and most webmaster/Anti-DDoS services such as CloudFlare will configure a specific rule to allow Googlebot to crawl in while blocking others. Using PageSpeed Insights to check the actual status of a website is very easy. All you need to do is enter the the web page URL to the box and click the Analyze button. If the website is down, the PageSpeed Insights will report “The website specified cannot be reached”. If the website is up, you will see the overall PageSpeed score together with a thumbnail screenshot aligned to the right. If you click the Critical Path Explorer, you will see the objects that are loaded from the webpage. 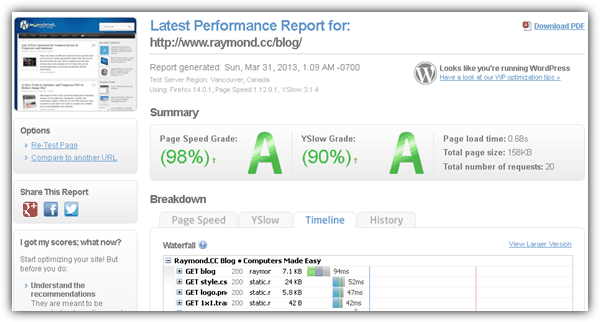 GTmetrix is another website performance analyzer that uses PageSpeed and YSlow to grade your website. Similar to Google PageSpeed Insights, GTmetrix uses their own servers from 6 different countries to access the website that you want to check although the test server region can only be selected if you sign up for a free account. The free account automatically uses the Canada server. Simply enter the URL at the box and click the Go button. If GTmetrix fails to access the website, you’ll receive a red “Analysis Error” message while the site that has a latest performance report shown means that it is accessible by GTmetrix. The Timeline tab at Breakdown displays a useful waterfall graph showing the loading behavior of the site. loads.in is a free webpage speed test powered by WatchMouse and an advantage in this service is the ability to check the website from over 50 locations around the world using 4 different web browsers. Do note that you’ll only get to choose the location and browser to check after the first test. The result of the test will show the time to load the web page including screenshots, waterfall chart and a downloadable Http Archive text file. Most importantly, loads.in is able to recognize any error messages or warnings when attempting to load the website. In a simple test we entered an unregistered domain to check and loads.in shows request timed-out error after trying to load the website for over 20 seconds. DotCom-Monitor Instant Test is a slightly more advanced service compared to the rest because it is able to check different protocols such as HTTP, HTTPS, SMTP, POP, FTP and UDP. For normal website you should use the HTTP check where you get to choose the request type either GET or POST, login credentials and additional parameters for GET, POST and headers. 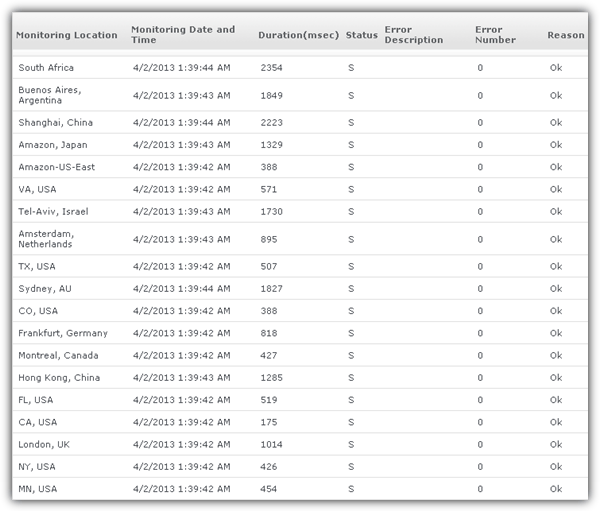 The webpage will be automatically checked with 19 checkpoints from 11 countries. To determine if a website is down or up using DotCom-Monitor Instant Test, refer to the error number, description and reason column. If you need a simple and no-brainer online tool to check if a website is down or up, Down For Everyone Or Just Me would be your best choice. Simply enter the domain name to the empty box found in between the words “is” and “down” followed by pressing the Enter key from your keyboard. The next refreshed page will only tell if the website is down or up without any additional details to support the result. After testing a few similar alternatives to Down For Everyone Or Just Me, we found that this one provides the most accurate results after trying a few methods to “trick” the service into thinking that the website is up but in fact it is down. We tried opening up a dummy port 80 which is commonly used by web servers to serve web pages but without actually serving any pages. Some detected that it is up while Down For Everyone Or Just Me accurately reports that it is down. Final Note: Using PING, TRACEROUTE or Port Scanner to check for open port 80 to determine if a website is up is inaccurate because the results simply tell if the server is contactable but doesn’t reveal if the web server software such as Apache or LiteSpeed is actually running and serving the webpages properly. The methods that we’ve shared above are far more reliable and accurate in revealing the actual status of websites when you’re unable to access them. This seem very simple and straight forward, but people tend to forget the little steps when their server is down. Thanks a lot for these sites y’all. Saves me the paranoia when I can’t reach a site. Cool. Next time if a site doesn’t loads I will ping it. Thanks. Cool, you saved me Ray. Interesting. Now at least I won’t reboot every time thinking Windows has a problem. Raymond, thank you for sharing. It happens to me all the time, I can’t access sites but friends and those websites can, quite annoying. One thing though that is the hosts problem is when you get blocked from the servers firewall, I got blocked from my own website once and it took weeks to get it resolved! Happened to me several times! Raymond, you did it again! You just gave another helpful tip. This guide definitely helps to rule out that it isn’t me having trouble loading a website.